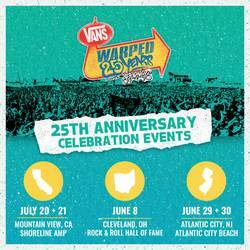 The Vans Warped Tour will return from retirement in 2019 for limited dates in honor of the tour's 25th anniversary. “It was truly an honor to do a final cross-country run of Warped in 2018; to see fans from all eras of the tour come out for a day to celebrate an event that meant so much to them. I walked away from the final show with a true sense that the Vans Warped Tour became the community I had always hoped for," founder Kevin Lyman says in a press release that simultaneously announced the tour's resurrection for the new year. Now scheduled for three dates across Ohio, New Jerset, and California, the new iteration is a two-day festival of 50+ bands per stop, including the return of live extreme sports. Pre-sale tickets begin on Feb. 25, with full sales and a complete lineup to be announced on March 1. Check out date, city, and venue info below.